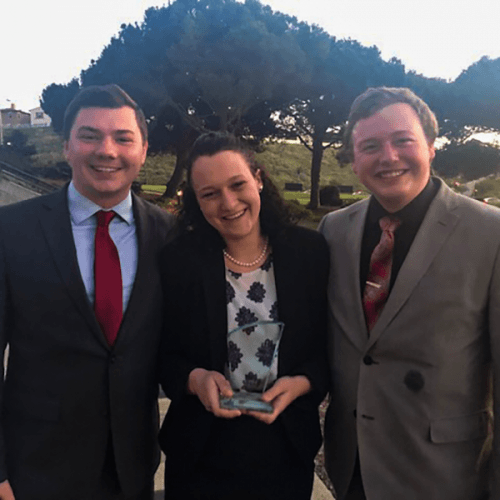 The Ripon College team, comprising Tyler Sturzl ’19 of Crandon, Wisconsin; Wyatt McGillen ’19 of Kalispell, Montana; and Haley Stowell ’20 of Eau Claire, Wisconsin, placed first in the undergraduate division of the International Business Ethics and Sustainability Case Competition this past weekend at Loyola Marymount University in Los Angeles, California. Their topic, “A Continent That Counts: Solving Statistical Inequalities with Clean Data Collaboratives,” focused on businesses investing in clean data collection in sub-Saharan Africa, with strong emphasis placed on improving agricultural, economic and humanitarian infrastructure. Judges were business executives from companies including Meggitt, CitiGroup, Siemens, Toms and Google. The competition took place over three days, and the Ripon team competed against teams from American University of the Middle East, Fordham University, Texas State University, University of Illinois, University of Melbourne, University of Northern Colorado, Mount Holyoke College and more. Posted April 15, 2019 in Ethics, Student, Sustainability by Ric Damm.